All pets should have current shots, including rabies, distemper or DHPP, and bordatella (kennel cough). Please have your veterinarian fax us immunization information or bring your own copy for our records. Pets should be neutered or spayed but Beacon Suites will consider exceptions. For the safety of all our guests and staff we only accept healthy and friendly pets. 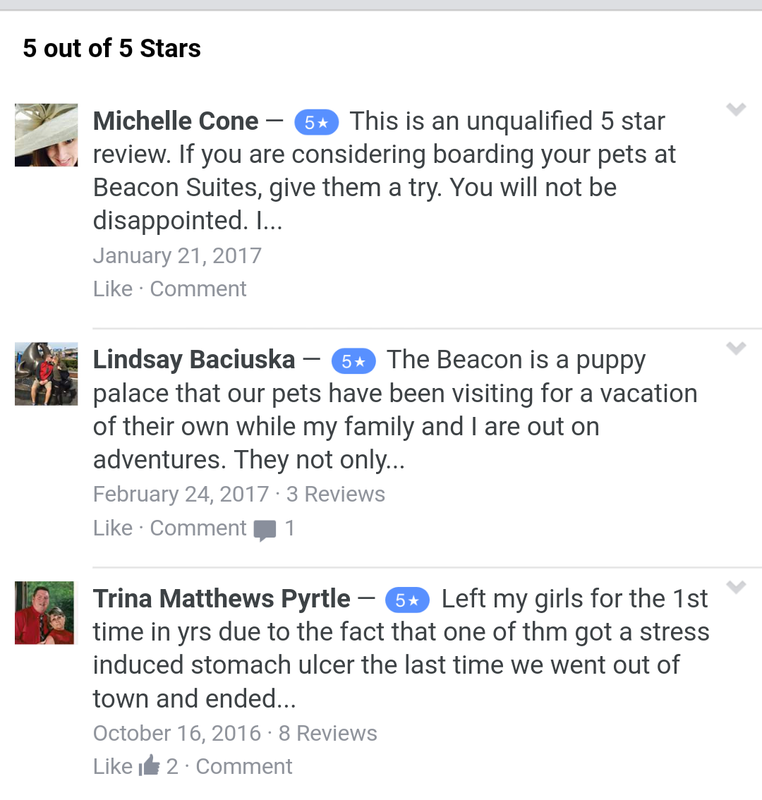 Beacon Suites, located in NW Greensboro, has a simple boarding philosophy: We are different from the dormitory kennels which hold 50, 60, or more dogs in cages or runs where they get lost in the crowd. We are maintaining our integrity of spacious personal suites for our guests and do not plan on adding any more boarding rooms. With such a small number of spacious suites, each guest is assured a comfortable, personal stay. 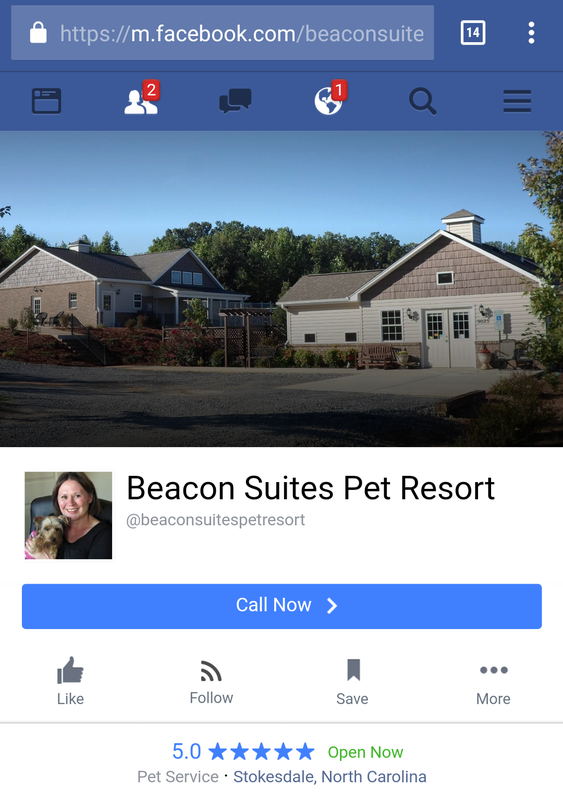 We are proud that Beacon Suites is a stress-free and very personal Boarding Kennel facility that goes above and beyond the average kennel to ensure your pets comfort and happiness while they are a guest with us. In 2011, Beacon Suites opened up with Building One which has 12 indoor/outdoor suites and four special needs suites. In July of 2014, the second building opened; where we have a full service grooming section with eight new King indoor/outdoor suites along with four new Special Needs suites. Our growth will consist of amenities that we will be adding more excitement and pleasure for a future guest. Follow our Facebook page for upcoming events and additions! Beacon Suites is small and is the most personal boarding kennel in the NW Greensboro area. 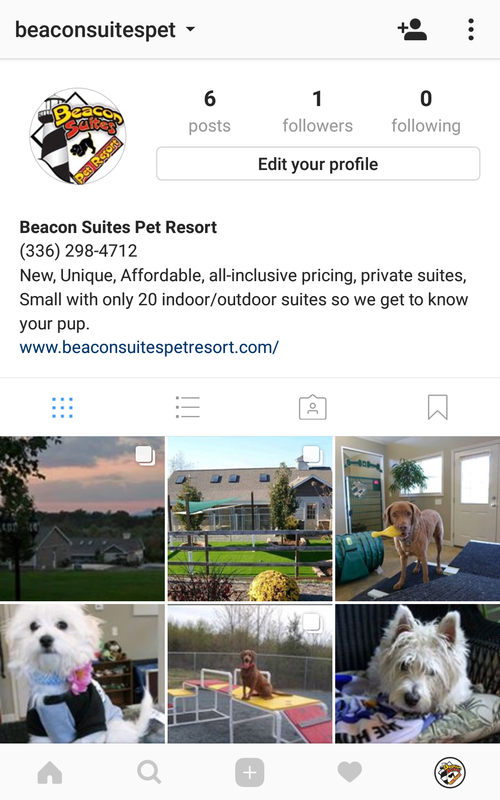 We are always on site to see to your pet’s every need, Beacon Suites is more than a dog boarding kennel; it is a pet hotel that loves to pamper your dog. And we do! All-inclusive, small facility – every suite is private. Family owned and operated facility. We live on the premises. Drop-off and pick-ups seven days a week. Open week days from 7:30am – 12:00pm & 3:00pm – 6:00pm. Saturday and Sunday pick-ups and drop-offs are available. Open from 9:00am – 12:00pm & 3:00pm – 5:00pm. Dogs enjoy exercise and play each day. Walks, yard play or agility are offered and suited to your dog’s needs. In 2016 our new large play yard has opened for hours of fun. Guests are encouraged to bring their own food to avoid digestion problems. New food and new environment could mean visits to the vet for an upset stomach or bloody diarrhea. We will be happy to give your pets any special diet you provide, refrigerated and heated if you like. Each Suite is large enough for families of two, or three, dogs to share one suite and stay together. Full grooming available. Call (336) 298-4712 for more information. TV’s and music in each building. Discounted Bath after a four nights visit if requested at drop off. Beacon Suites administers your dog’s medications per your instructions. There is no extra fee. All dogs are let out for an outdoor break at least every 3-4 hours per day no extra fee. Our special needs area is located beside the office, these guests are getting the attention needed due to being young, extra small, shy, timid, old, or handicapped or needing extra care. These dogs also have a large grassy turf let out play area. These suites are great for one dog or two medium or small dogs that enjoy being together. These suites will accommodate the largest dogs or large families. Additional pets sharing same suite: Rate of $15 for each additional dog. DayCare: $20.00 per day plus $15 per additional dog of immediate family. We only do day care if day capacity is available. Discounted Mon-Fri Pass available upon request.